It looks like it could be a late SNES, 2D PS1/Saturn, or early GBA game from the looks of things. 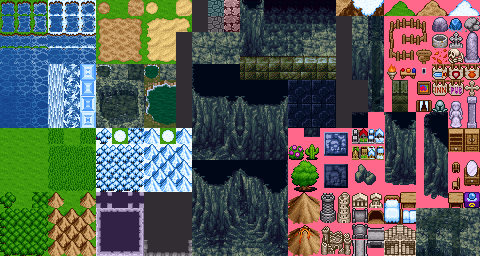 If anybody recognizes this tileset, please let me know so I can finally put this to rest. I am very much willing/expecting to feel like an idiot it such is the case. Admins/mods, feel free to move this to the right area if this isn't it. EDIT: Please ignore the obviously RTP bits. I'm mostly looking for the source of the blue cave tiles. Some of it look like the SNES remakes of Dragon Quest 1-2-3 (the purple swamp, king's throne) mixed with some RTPs, and maybe some FF (4?) for some worldmap items (towers especially). I'm not 100% sure. 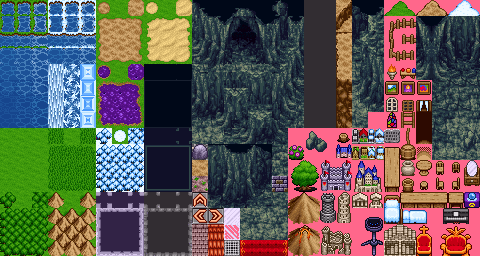 Though I did check out the DQ3 remake; the cave tiles do look similar to that game's area (which in turn look similar to RM2k3's RTP, incidentally), but I didn't see a match. I finally found the source. Now I can move on with my lifeproject. May have some tileset compiling to do first though. I do want to thank everyone who responded. I may check out some of the other games mentioned. 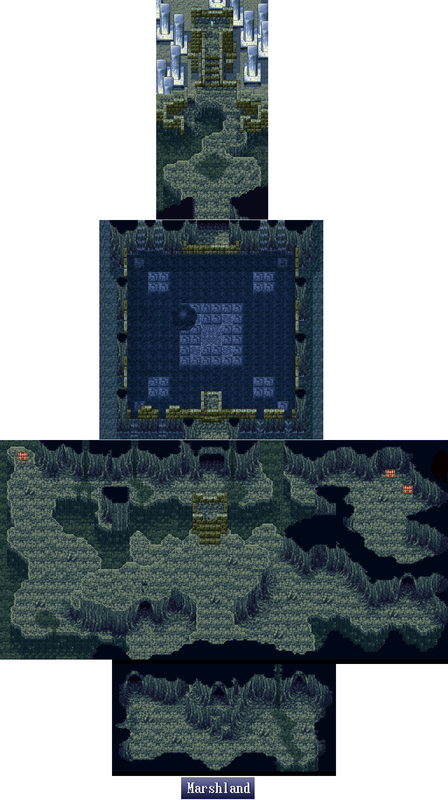 Also, Rudra's maps, while themselves pretty good, are of a notably different style. Bob the Taco (who is/was apparently a prolific tileset maker in the old days) has some examples on his (archived) site (which, incidentally, provided the answer to a previous Great Tileset Search). Live-a-Live, while having remarkably similar cave tiles (especially for the Medieval chapter), wasn't a 100% fit. Oh Ys. I don't think I've ripped or played them. Fascinating how the map cuttaaways line up like that so smooth! Yes Bob the Taco was a greatchip maker in he olden times though some of his sets are incomplete nowadays. I think I used some of his work for my star ship opening map in an attempt to revive Warp's lovechild: Dentverse Origins. Hey if you're this good at tracking down old tiles you might be helpful when I make my sequel since I'm always recycling tile sets too much and Juno's Iliad will have a ton more explorable maps with a need for unique maps. Can't promise you money but life eternally in a chain game is pretty sweet no? plus if it doesn't kill me this time I'll make a real credits instead of that weird hyperspace snowflake I did in the first game with all the chapter authors standing around. I like this one as well. I heard that Juno's Iliad has a ton more explorable maps with a need for unique maps. They say any publicity is good advertising but this hurts actualy since I lost both versions of Juno's Illiad in the move. Meteo that bot, Purps.